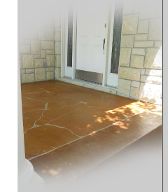 With decorative concrete, possibilities to rejuvenate your home living style are limitless. We are happy to assist you with any design ideas you may be contemplating at a no cost consultation in person, by phone or email. Your imagination, our expertise.....Lets see what we can create!